Girls practice the Scientific Method through a citizen science project focused on the outdoors. Girl Scouts has partnered with SciStarter, a website that allows data collected by girls to become part of national studies. The Take Action Award is earned as part of the 4 new Journeys - Think Like an Engineer, Think Like a Programmer, Think Like a Citizen Scientist, and the Outdoors Journey. 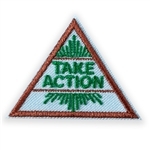 Girls must complete a Take Action project relevant to what they've learned on their Journey and earn the Journey Award plus the Take Action award when finished. Girls who complete multiple of these new Journeys will complete a unique Take Action project for each Journey and will earn the Take Action award multiple times. 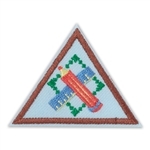 Girl Scout Brownie Journey Award Patch Set is iron-on. 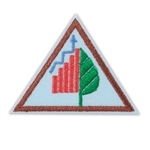 Patch set has four triangle shaped patches with three keys and lock design. Earned Award. 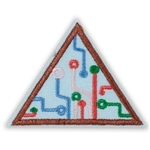 Iron-on Patch set of four triangle shaped patches that represent water. Imported. Iron-on patch set of four triangle shaped Brownie elf patches. Imported. Iron-on Patch.